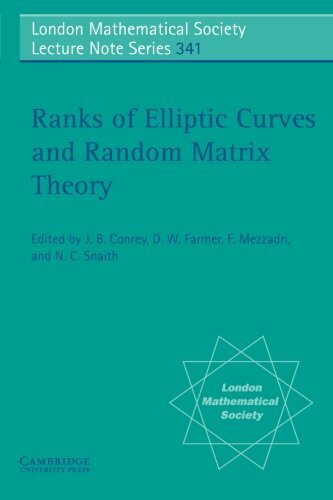 [PDF] Ranks of Elliptic Curves and Random Matrix Theory (London Mathematical Society Lecture Note Series) | Free eBooks Download - EBOOKEE! Description: Random matrix theory is an area of mathematics first developed by physicists interested in the energy levels of atomic nuclei, but it can also be used to describe some exotic phenomena in the number theory of elliptic curves. The purpose of this book is to illustrate this interplay of number theory and random matrices. It begins with an introduction to elliptic curves and the fundamentals of modelling by a family of random matrices, and moves on to highlight the latest research. There are expositions of current research on ranks of elliptic curves, statistical properties of families of elliptic curves and their associated L-functions and the emerging uses of random matrix theory in this field. Most of the material here had its origin in a Clay Mathematics Institute workshop on this topic at the Newton Institute in Cambridge and together these contributions provide a unique in-depth treatment of the subject. No comments for "[PDF] Ranks of Elliptic Curves and Random Matrix Theory (London Mathematical Society Lecture Note Series)".